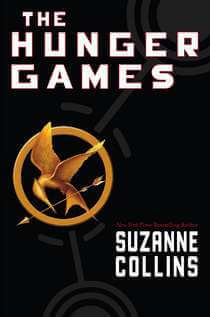 The Hunger Games, by Suzanne Collins was likely the most-recommended book of the year for me. It seems everyone wanted to tell me about this book and how I should read it before I’m a moment older. So, I finally read it, and I have to say that it is a pretty good book. It’s definitely quite a twist from the usually futuristic fiction junk that’s out there. I read the entire book in a day (Being imprisoned in various stores with my family for most of the day helped, though). The story in this book is interesting (warning, spoilers ahead). When Katniss sees her twelve-year-old sister Prim get chosen as a tribute she panics, and volunteers to go in Prim’s place. Thus, Katniss finds herself at the 74th Hunger Games. Since most of the book tell about her involvement in the Games and how she survives, one would think that the book is boring, or ‘just a bunch of killing.’ Instead, Collins writes this book so that the Hunger Games make us root for Katniss. She shows us Katniss as a person, and develops her eagerness to defy the Capitol (which will probably play a major part in the later books, somewhat predictably). That being said, there’s a lot in this book that’s different. The obvious point would be the bulk of the book concerns 24 kids trying to kill each other. This book isn’t exactly light reading. Then again, it doesn’t dwell unnecessarily on gore or death. Some of the stuff in this book is still disturbing. It’s interesting to see how Collins works with the Capitol issues in the book. Of course, since the Capitol forces the children to kill one another, we recognize that is wrong. Still, Collins takes this to the conclusion that the characters should rebel against the government, which is a grey area morally. It’ll be interesting to see how these two topics evolve in the next two books. Still, Collins makes things clear. Overall, I felt like this book set me up well for the second and third books, and got me ready to read more about these characters (I really liked Katniss; really disliked Peeta, the second main character). At the same time, the book resolves itself. It’s not a book that relies on the rest of the trilogy to make sense. Overally, The Hunger Games was an excellent read. I can see why so many people recommended it to me. If you’re looking for a ‘teen’ book that’s actually worth reading, or a sci-fi book that’s not exactly like the normal flying spaceships and light-sabers, this book is for you. But if you do read it, hurry up and do so; there’s a movie coming out in early 2012 and everyone knows you need to read a book before you watch the movie. Thanks for the review, Andrew! I’ve heard a lot about this one too, so it’s good to get your thoughts on it. The sequel, Catching Fire, is quite good, with Collins ratcheting up the tension and bizarreness of the story. Mockingjay – the third book – is definitely the darkest and most violent installment of the series, but it’s my favorite due to the brilliant way it brings everything to a close. Andrew, as I mentioned the other day, I have some questions regarding this series. After reading Cory’s review, I was quite intrigued, but when my mom and I looked into the books, and read some of the reviews on Amazon, it looked as though the books were simply the glorification of 24 teens battling to the death! After reading you review however, I’m not so sure. Now that two of you have recommended the series, I’m getting curious again. So, could you expound some on the themes these books cover? The heart of the story, if you will? And also I’d appreciate (if you have time) a detailed content analysis of both the good and the bad to be found in the series. The Bad: There is violence present. The Good: This violence is not encouraged. At the book you find yourself HATING violence and all that the characters were forced to go through by the capitol. While 24 teens to battle it out to the death, Collins brings out the emotional pain behind such violence very effectively. Ooops, that should be: At the END of the book… etc. – The books are extremely well-written. They’re gripping, and I seriously read all three in about two days. – The characters themselves are deep and complex. Collins writes really good emotion. Really good. – The premise of the story is intriguing, and it doesn’t condone murder/fighting, though that plays a large part in the plot. This is always seen as the oppression of the Capital. – The books become really really dark, unnecessarily so, in my opinion. – One of the downsides of Collins’ mastery of emotion is that you get so enmeshed in Katniss’ emotions that you just get depressed. Despite the excellent story, it made me want to put the books down several times. This becomes more obvious in the later books. Caleb, I dislike Peeta just because of the general feel I get from him. It’s hard to explain.